Oli Kellett is a self-taught British photographer based in Hasting, UK. After starting his career as a creative in the advertising industry, Oli’s passion for photography took him behind the camera creating conceptual imagery for many campaigns. 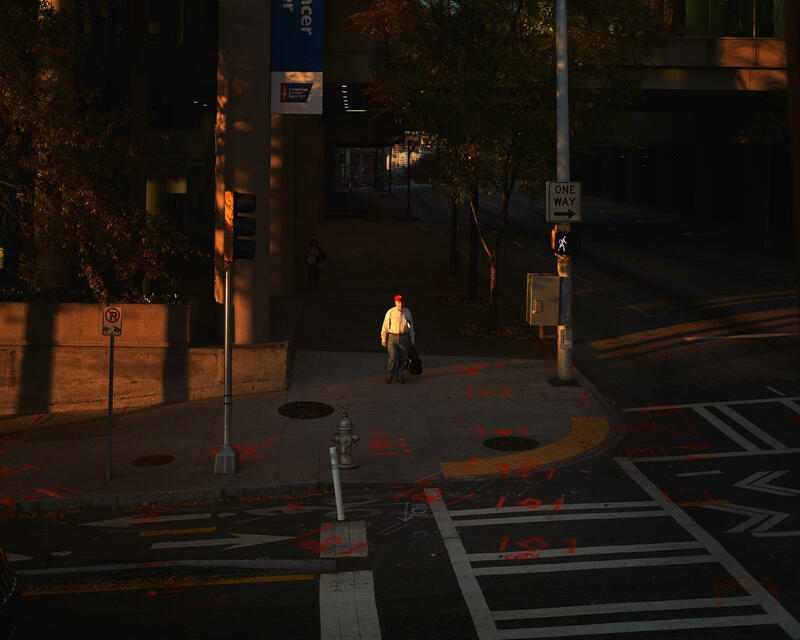 For the past two years, Oli has focused his time on Cross Road Blues, an ongoing project using large format photography to capture people at urban intersections as they navigate their lives. Work from this series is currently at London’s HackelBury Fine Art gallery until 23 February 2019 – Oli’s first solo exhibition. Highlights were also at last month’s Paris Photo and earlier in 2018 at the Royal Academy (RA) summer exhibition. The RA recognised this work as outstanding with two accolades: The Arts Club Award and The Rose Award for Photography. You can tell Oli has taken his time with Cross Road Blues; there’s a slowness and painterly quality to it. 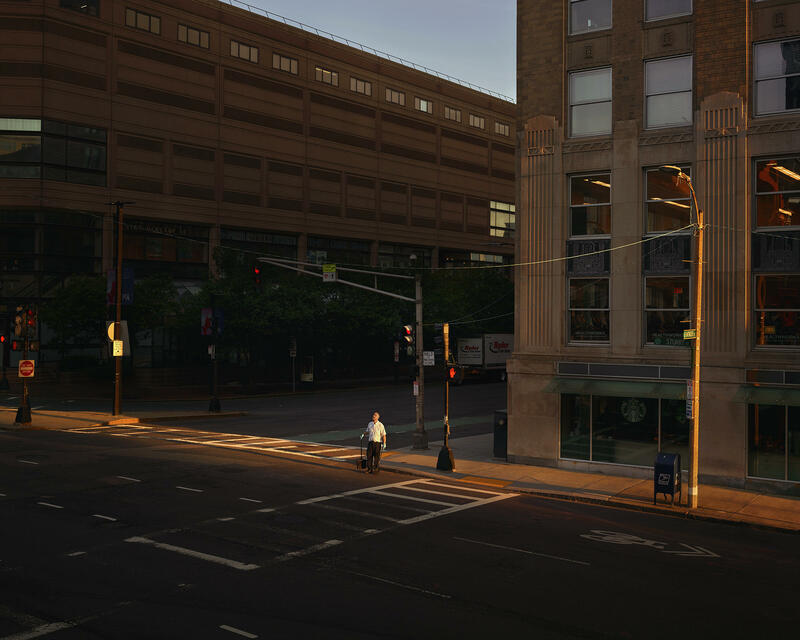 The images feel incredibly composed, theatrical almost, and the light is insanely beautiful. We hear more about Oli’s journey with this project and how he pushed himself to step away from commercial photography. The crossroads project is a really strong body of work. It’s been quite successful and you’ve won a few awards. Can you share some insight on how it started and how it’s evolved? It began in November 2016. I was over in LA in the run-up to the election and I thought it would be good to start a really specific short project. I had this idea of walking along Hope Street, where I was staying, just because it’s a long street. And I thought about wandering up and down there repeatedly and trying to create a small project of five or six pictures, just to kind of gauge the mood of the country going into this election. I understand what an enormous country America is and how the politics kind of affects the whole world, but news about the U.S. election was just non-stop over in the UK in the six months before it. So I felt I should create something because I had some spare time while I was there. 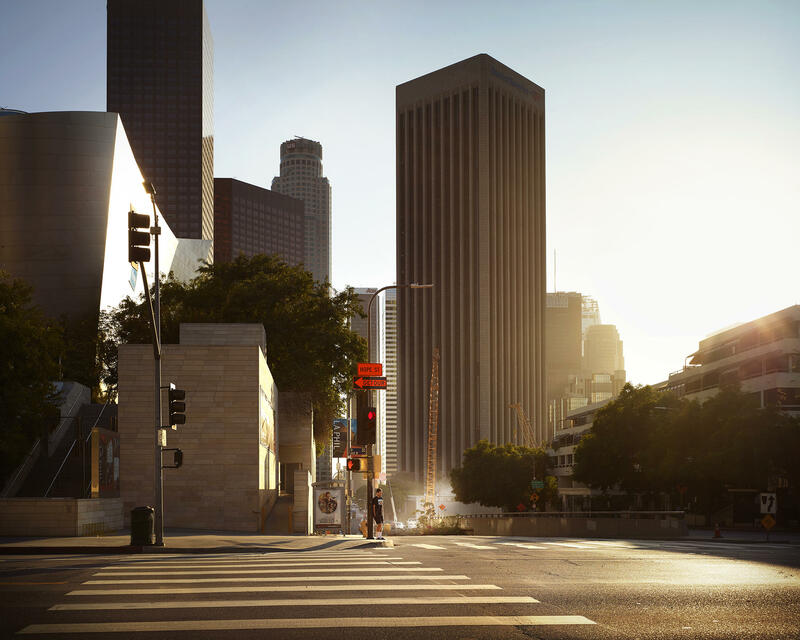 I spent 10 days walking up and down through downtown LA. Hope Street seemed poignant because it made me think of that Shepard Fairey print for the Barack Obama campaign, where he had the word ‘hope’ written underneath the Obama portrait. That’s why I thought I’d quite like to walk on Hope Street as the name somehow linked it to U.S. politics. The signature on this project is so strong. Did you anticipate what the work was going to look like? No, not at all. I’d been thinking about trying to shoot people at crossroads in the UK for a while and I was after something very specific. But I hadn’t quite worked out how to shoot it over here because we don’t have streets like you get in America – with all these grids. There’s also that late afternoon light that spreads down the entire block and looks incredible, which we don’t really have at all in the UK. 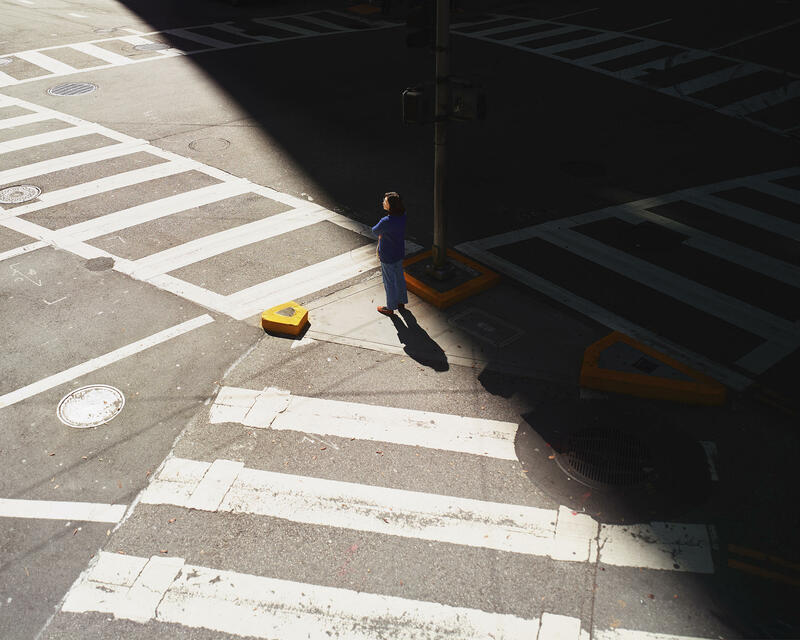 It just so happened that I took a picture of a lady waiting at a crossroad in LA and I was quite high up and the light was just perfect. I wasn’t actually over there to shoot pictures of people waiting at crossroads, it was just one of the many pictures during those 10 days and it was only when I got home that I realised perhaps it meant a lot more about America being at a crossroads politically. It made me think about choices and different directions and I started thinking a lot more about crossroads as a bigger idea. I’ve made about a dozen trips to the U.S. since then, specifically looking for people waiting at these intersections. The project has become about which way to turn when you’re not really sure what’s real and what’s fake, in life and in the news. There’s a great jazz musician called Robert Johnson and this story about how he sold his soul to the devil at a crossroads. 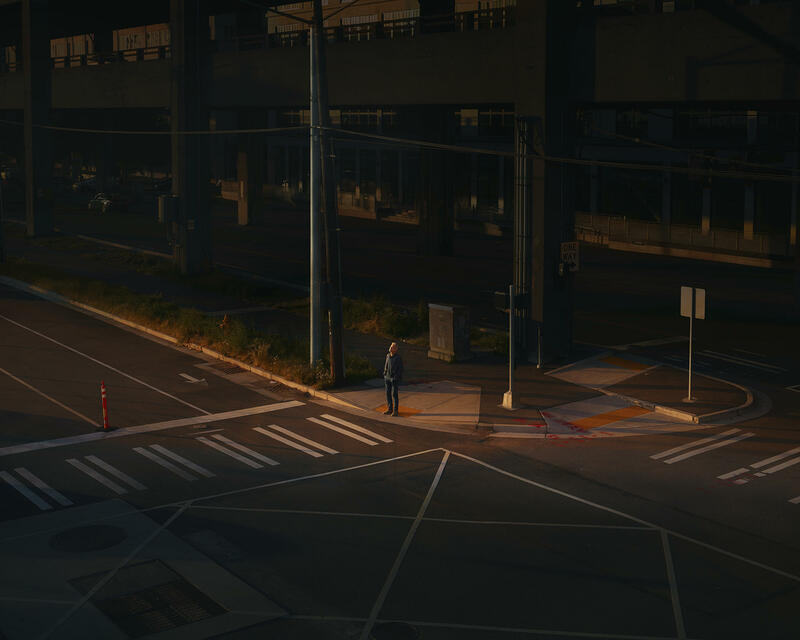 I’ve always quite liked this idea that when people have to wait at crossroads it’s a really short period of time where you’re physically forced to stop and be alone with your thoughts. And you can always be visited by thoughts outside your control, so you’re almost waiting there, ready for the world to tell you which direction to go in. Some people get that look in their eyes when they’re waiting to cross a road. And I’ve actually always been interested in taking pictures of what people look like when they’re thinking. You haven’t got time to get your phone out but it’s perhaps just long enough for you to kind of adjust your moral compass. That’s what I was interested in with the symbolism of crossroads. But it’s also about waiting. I feel in the UK at the moment there’s a hell of a lot of waiting around Brexit. Everyone’s waiting. It’s a very similar feeling here right now to how the U.S. was in 2016: waiting for politicians and the country to decide. So although this work is shot in America, there’s definitely a feeling that it’s interchangeable with the UK. It also feels like around the world in general, people are a little bit unsure about what direction our planet is heading. So this project is about waiting, direction and choices. Do you think that’s why the work has resonated so much in the UK as well as the U.S.? 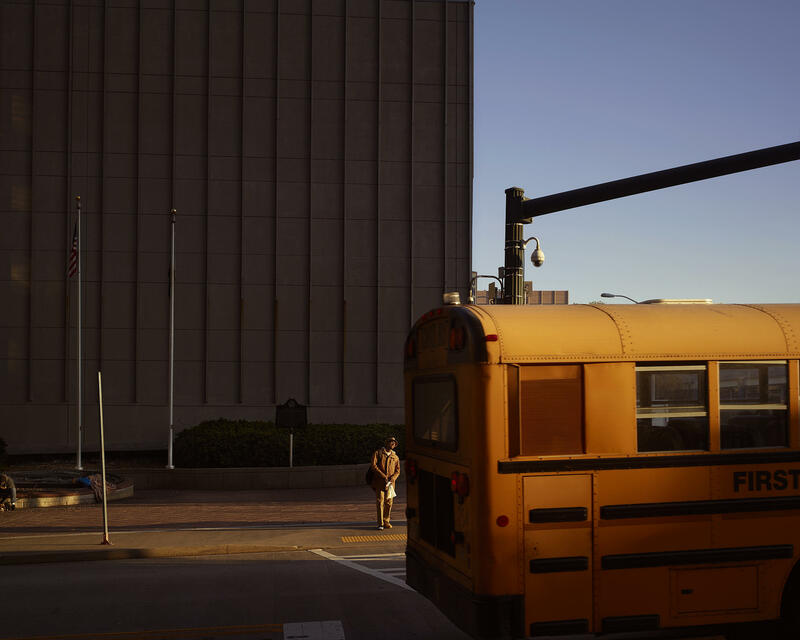 British photographers love American light and the U.S. in general. The history of photographer and photography is so rooted in America, especially in 1960s colour photography. 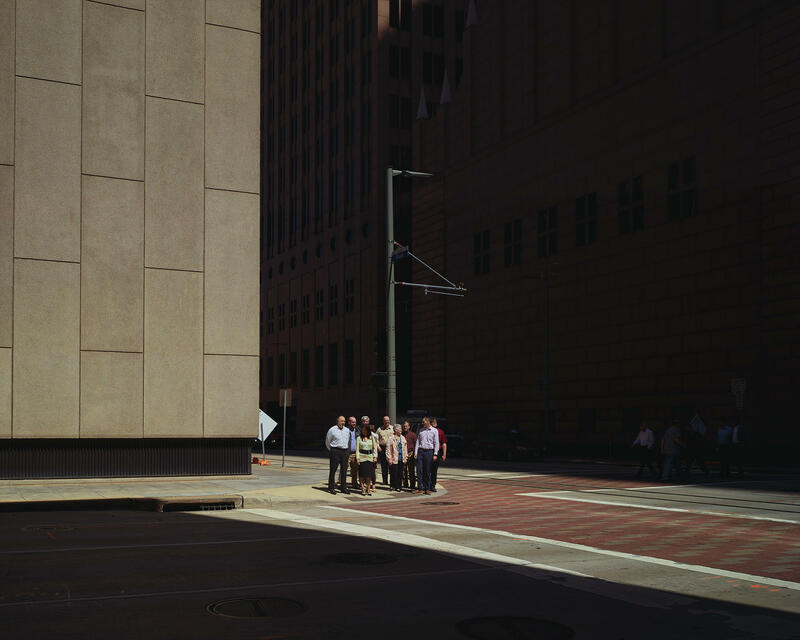 Street photographers from that era have heavily influenced me for the past 10 years. I love being in the U.S. and shooting over there. Where else did you visit after LA? I’ve been to Atlanta, Boston, Chicago, New York, Phoenix, Seattle and other major cities. And when I’m in these places, I try to get out all day, every day, getting up for dawn. The prints are pretty big. Why? I’ve always been interested in big prints and the effect that they have. Mine are 60 x 75 inches; so nearly two meters wide. Because I’ve been shooting people who are relatively small in the actual frame, I think the prints need to be big in order to see the detail in the people. Is having that kind of novelty [of new cities and being British] important to your process? The contrast of travelling from somewhere like Hastings to Houston is huge. Do you think that’s helpful to you? Yeah I think so. Photographers often shoot what’s on their doorstep and I remember when I was at college, 15 years ago, being told not to travel to foreign countries, to shoot what you know. Some people can do that and others get bored of it, so I’m quite happy to go off and explore. I really am happiest when I’m walking. As it’s developed, have you shared the project with other photographers, peers or mentors for feedback? For most projects you kind of see the final body of work and it all makes sense. But with something like this, that’s shot for real on the street, there is a huge amount of uncertainty going into it. I only really showed a few people at the start of the year. And it’s crazy, because in the past, I’ve shot lots of things where it’s a much quicker turnaround of imagery. You’re showing people almost as soon as you’ve shot it, either because you need to show a client or have a show. And of course we live in a crazy time where you shoot something and then it’s immediately online the same day. It’s hard to go from sharing work on Instagram or updating your website to not doing anything like that for an entire year. But I think it would have become something different if I had. I think you need to kind of go back within yourself and think about what it’s about and what you want to share with the world. I’m trying to get away from this need to share stuff quickly. I do think there is still a time and a place for long term projects. And with these, less is more. It’s a brave choice to step away in what seems like a really rough economic time for photographers. You were also commercially successful and quite a known entity in the UK especially, for a distinctive style of commercial work. I think sometimes you’ve just got to do what you feel is right. I’d always been shooting projects on the side of commercial work. But I think trying to split myself both ways meant both probably fell short of being as good as they could be. At some point you ask yourself how you can make better work. But it’s not a glamorous life. Whenever I tell people I’m off to America again they think it’s such a dream. But the reality is that my alarm goes off at 4.30am, I have some crappy microwave porridge, then I go walking and get disgustingly filthy from the dust. And then I go to bed early, wake up and do the same thing again. But there’s nothing I’d rather do. Tell me about how you got to here. You’ve had quite an interesting career journey that began in advertising. It seems like you’ve made some pretty radical decisions throughout your life. Yeah. So I went to Central Saint Martins [art college] and from there I got a job in an ad agency with another advertising partner. We had four years at a few different ad agencies in London, writing TV scripts and coming up with print ads. But I was shooting my own black and white street photography on the side and always wanted to be a photographer. Eventually, I left the advertising world and carried on shooting in this style. Obviously I ran out of money pretty quickly. I showed my portfolio to some people at my old ad agency and they told me I was never going to get any jobs with it. I didn’t understand why because I loved photography and I just thought people who got ad jobs loved photography. So I started to shoot colour too and bought a large format camera, photographing more landscapes and creating another portfolio that was better aligned with advertising. Once I had an agent, things started going more in that direction. I also shot a project called Welcome to Paradise [he travelled the UK over four years photographing places with the word paradise in the title; unsurprisingly many were far removed from the utopian vision]. You only ever did a few days assisting, so how did you learn about the technical side of photography? I always had good assistants and there are so many great ones out there. You say ‘I want it to look like this’ and they know exactly what to do. A few photographers had told me ‘You don’t need to learn that, you just need to get good assistants’. And it’s true. Even if you are a massive geek about cameras, you can never hope to keep up with the technical side of advertising shooting; the moving image and different advancements in lighting, so you always need to work with good assistants. They are on sets all day learning about all this. I kind of just made it up. But I also think not going down the traditional assisting route was probably a good thing because it meant I could go out and shoot stuff I wanted and then try and show it to people. I was definitely fortunate that I’d worked in an ad agency. I understood the role of the photographer in the grander scheme of the process: from an idea in a client’s brief, through to the creative team and seeing it through to production. Circling back to Cross Road Blues and New York, you said you shot hundreds of images but none made the cut. That must be frustrating. How do you navigate your way through all these images? What’s your process? Do you work completely on your own or seek any advice? I work completely on my own. I’m usually pretty sure whether I’ve got the image as it’s a large format digital camera. It’s got the movements of a traditional large format camera; so it’s got that rise and fall to create the parallels of the buildings. But it’s got a digital back on it so I can obviously download the images onto my computer. I’m pretty sure when something’s gone well. When I do a proper edit to see what I’ve got it is really frustrating, especially if you go somewhere like New York and feel like you’ve come back empty-handed. But maybe that’s also because New York has had so much great photography done around it. It’s also super busy, there were just too many people around. 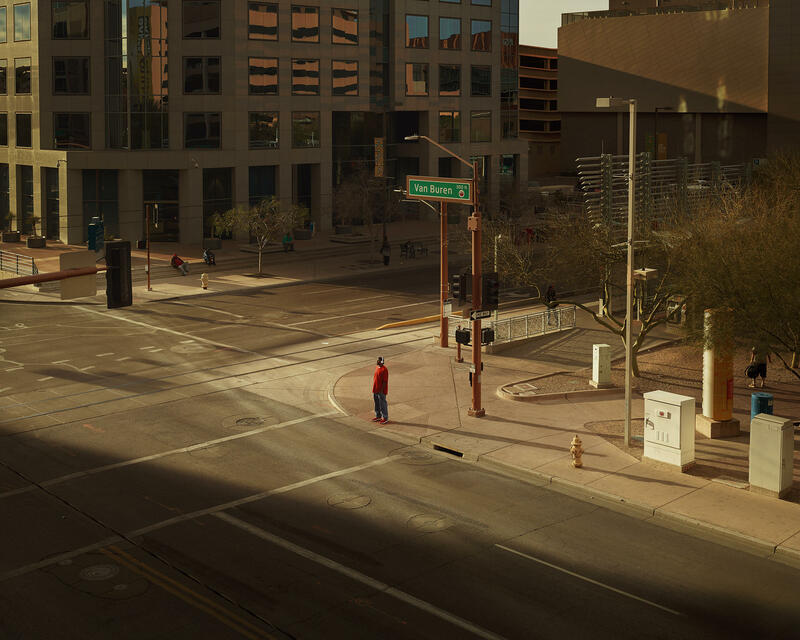 So then I go somewhere like Phoenix and as soon as you get outside of the business district, it’s almost desolate. When you’re doing a proper edit, going through hundreds, maybe thousands of images, are there any surprises – something you thought was good doesn’t work or the opposite? Yeah it works both ways. There was a shot which has turned out to be one of the favourite ones. 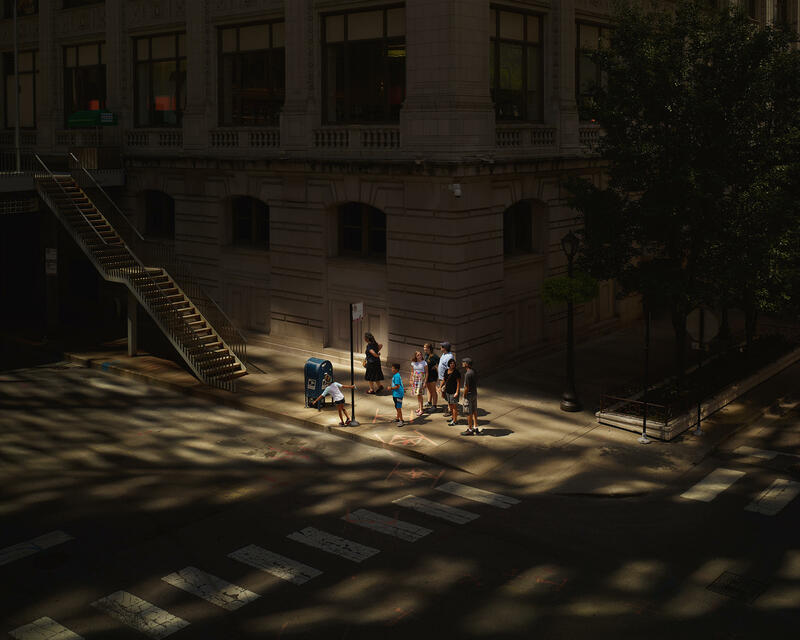 It’s of a family waiting and they’re all looking in different directions in this dappled light in Chicago. It was the only shot I looked back at a year later and realised was pretty good. I thought ‘Wow, I can’t believe I missed this one first time round’. Is the print exhibition the final goal? Yes. I just want these pictures printed big and for people to spend time with them. So that’s the end goal. To see them like this is everything I wanted this project to be. How do you stop something like this – it seems like it has built momentum. Do you have an end in mind for it? Originally it was going to be a four-year project and I think it probably still will be. Only because that’s how long a U.S. political term is. But it might also be a project that carries on, so that it’s not so much about the American election but a bigger concept about individuals and life choices. The photographers whose work I really love is when they shoot the same thing over and over. I really love the idea of the long-term project and especially nowadays, with this expectation of sharing everything as soon as it’s finished. And I love the idea of a concept almost naturally revealing itself by the process of shooting the work, rather than forcing it or having a very constrained idea of what it’s going to be before you start. A lot of the photographers I’ve learnt about through my whole life are the people who have literally gone out the door and started walking and taking pictures. Perhaps their work then progresses into a bigger body of work, but it always starts with just getting out there. I still have so much respect for people that do the absolute opposite, who are very pre-meditative and know exactly what they’re going to shoot. But at the same time I think real life is amazing. David Hurn, the Welsh photographer and Magnum legend, says he never feels the need to create anything because he finds day-to-day life so interesting and fascinating. So he just wants to document what’s already there. Totally. His work is amazing. He also wrote a great book with Bill Jay called On Being A Photographer. In it he talks about how often he gets a successful shot and says it’s roughly one in a hundred rolls of film. It’s the absolute opposite of the world we live in now, where you literally take a picture, then put it online because it represents what you’ve just created. Whenever you read articles about social media – Instagram, in particular, people talk about the amount of visual noise being made. This idea of everyone competing for attention. On the flip side is the huge opportunity this gives for a project like Cross Road Blues and the way you’re working in general. Suddenly the skill of what you’re able to do is highlighted. This idea that it’s relatively easy to take a good photograph but really hard to take them consistently and to produce a series of good work that sits together or tells a story. Thank you. One thing I wanted to mention is Paul Gauguin and a painting of his I saw a while back, Where Do We Come From? Who Are We? Where Are We Going? It was so perfect for what I was trying to shoot at the time. It’s all about this idea of life as a journey along a road, where you’re presented with decisions that can take you one way or another. Gauguin said ‘In these modern times the human mind needs to solve this riddle in order to see the way before it more clearly, in order to stride firmly towards its future without stumbling, deviating or taking a step backwards’. Gauguin was going insane at this point in his life but I think he was trying to answer this philosophical life question: about where we have come from as humans, where we are going and how we can improve that. So I’ve kind of always got a bit of that in my head: how can this project try and represent something a bit bigger than someone just standing at a road?